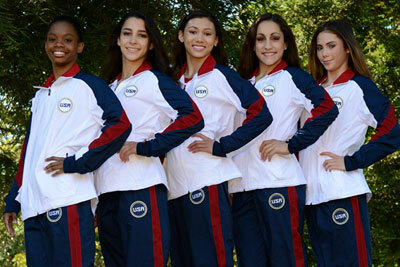 SAN JOSE, Calif., July 1, 2012 – USA Gymnastics today announced the gymnasts who will represent the United States in women’s gymnastics at the 2012 Olympic Games in London. Gabby Douglas of Virginia Beach, Va./Chow's Gymnastics and Dance Institute, automatically qualified to the team at the conclusion of the women's competition at the 2012 U.S. Olympic Trials – Gymnastics after winning the two-day all-around. The balance of the team and the three replacement athletes were chosen by the Women's Selection Committee. The members of the Women's Selection Committee were: Martha Karolyi, women’s national team coordinator; Steve Rybacki, International Elite Committee chairman; and Terin Humphrey, athlete representative.